• 6 Bedrooms that sleeps 12, 4 Bathrooms (3 en-suite). • Master Bedroom is en-suite with king size bed. • 2 other bedrooms have double beds. • 2 bedrooms consisting of twin three quarter beds. • Gourmet kitchen with separate laundry. • 4 Patios for different times of the day, overlooking amazing views of the backdrop of Table Mountain. • Large heated pool (12x15m) which boasts different colours at night. • TV with magnificent views of mountains & gardens. • Large LCD TV with DSTV. • ADSL line with 24hr WiFi Connection. • Indoor & Outdoor fire places. • Off street & secure parking with High Perimeter walls. •High Security and large gates with intercom/video system to screen your guests. • Magnificent views of mountains & gardens. 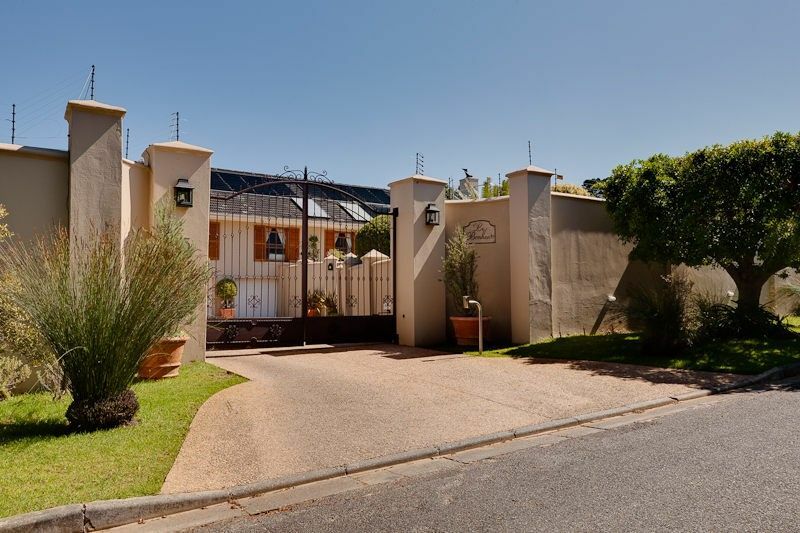 • High Security and large gates with intercom/video system to screen your guests. It is spacious is well designed & spread out to cater for Large or smaller groups for Summer & Winter Holidays & is very well positioned to the Airport & most of the popular tourist spots in & around Cape Town including The waterfront Table Mountain Most of the Popular beaches including Boulders Penguin Beach in Simonstown on your way to Cape Point. 5 Minutes from Constantia Shopping villiage for your daily needs as well as Top Restaurants & our Top 12 Wine Estates in the Constantia Valley most of them also offer top Restaurants not to be missed & top Golf Courses. Large Solar Heated Pool & Solar heated jacuzzi 3 Covered Patio's with Modern State of the Art Stacking doors that give you the feeling of being outside with a manicured Garden Central Safe secure with spectacular Views of the backdrop of Table Mountain from our Top Sun Downer Patio with amazing walks & Bike trials on our door step. Comfortable beds & a Team that will spoil you while on Vacation in Cape Town. We Have Solar powered Geysers and proud to conserve energy by using our natural resources. We also have our own borehole which has been beneficial to our guests in the middle of the our severest drought in recorded history. Heated Pool and Jacuzzi is surrounded by four patio's ideal for Summer & Winter vacations. Ideal for extended families, functions, Weddings, Bithday parties etc. Protected from the summer winds, making it an ideal venue for both summer and winter vacations and within easy travelling distances to many of the well-known sight-seeing spots found in the 'Mother City'. Le Bonheur is ideal for Film shoots, Company Conferences, Small Weddings or just for the family, couple looking to get away from the hustle and bustle of everyday life and having a holiday of a lifetime. Central to the six top Wine Farms in Constantia Valley, Golf Courses, Beaches, Top Restaurants & Bars, Kirstenbosch Botanical Gardens, Table Mountain and the V&A Waterfront.